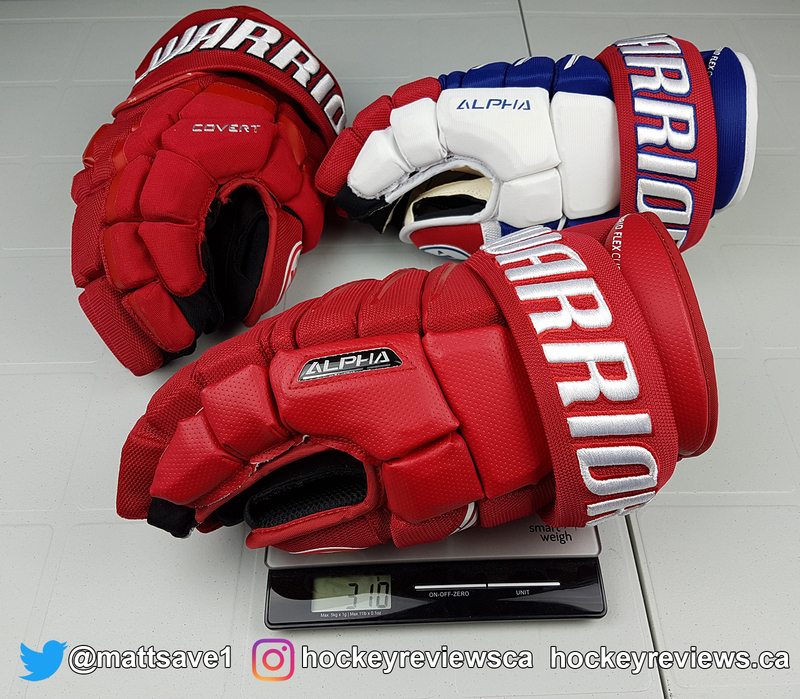 Warrior sent me a pair of 15” Alpha QX gloves and a pair of 14” Alpha QX Pro gloves so I could do a comparison of the different materials used and features each glove has. That article/video will be coming in the near future. 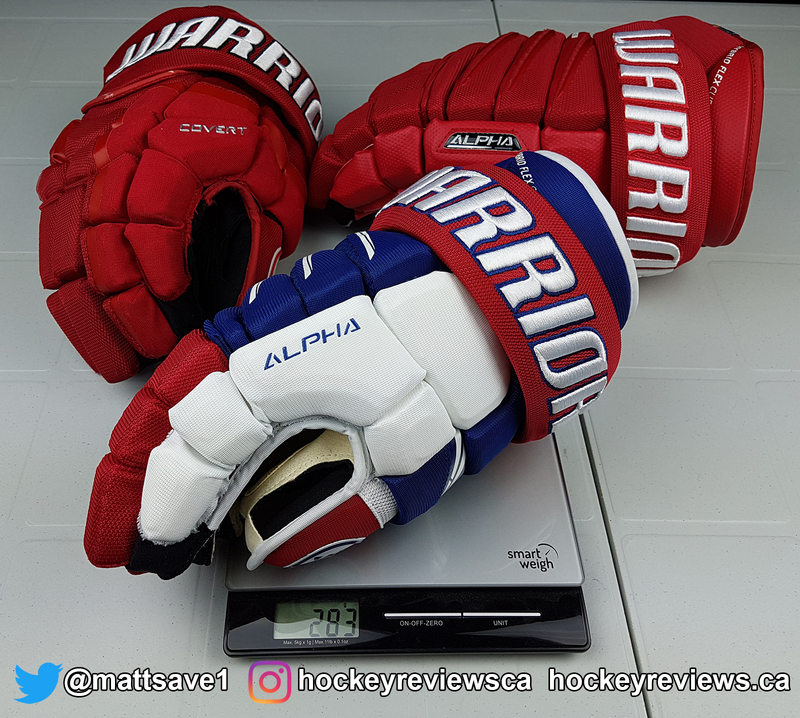 I asked for the 2 different sizes so I could compare the fit of the 14” Alpha QX Pro gloves with a friends Warrior 14” Franchise. If you are unaware the Franchise is one of the most beloved classic 4-rolls and many players say they were the pinnacle of comfort. When Warrior discontinued the Franchise gloves there was an outcry in the die hard gear community, the Alphas are an attempt to modernize the fabled Franchise while retaining the comfort and feeling of the classic 4-rolls. Enter Warrior’s Butter Soft Feel claim. 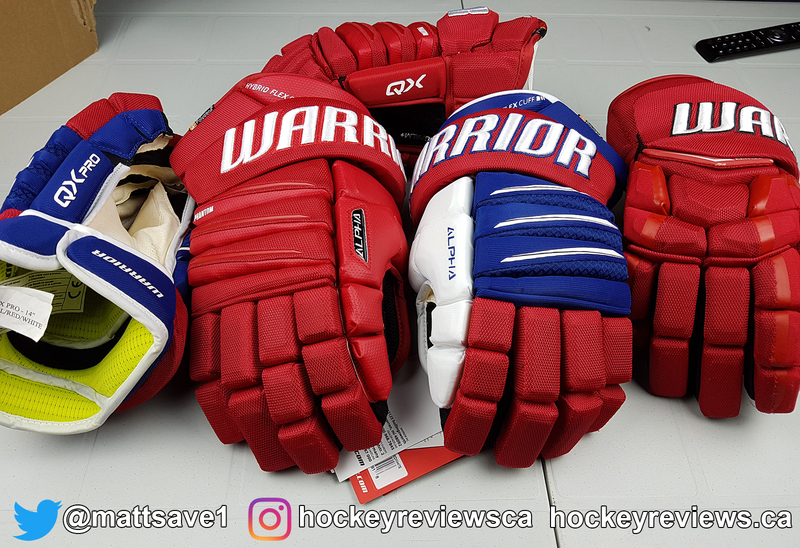 I would have to agree with some of the critics of Warrior’s previous generation of 4-roll gloves in the Dynasty AX1. Putting those gloves on next to a pair of Franchises (specifically Pro Stock Made in Canada Franchises) and I immediately felt a downgrade in comfort and feel. Warrior rectified this with the new Alpha QX series, both of my QX and QX Pro gloves felt wonderful out of the box. The “butter soft” claim is certainly justified and both of these pair of gloves feel broken in and surround your hands with extremely comfortable materials. I will go over these materials in a future post and video. Before I get to the weight of the gloves I want to quickly comment on the angled backhand 4-roll design which gives the Alpha QX gloves a more flexible backhand that flexes and bends with your hand in an anatomical way. My quick test for glove flexibility is to see if I can touch my pinky to my thumb, more traditional 4-roll gloves have difficulty doing this. This movement can be achieved if you cut the thumb loops (something I don’t do) or if the gloves have a flexible thumb construction. The Axyflex Thumb on the Alpha QX gloves and the angled backhand make these Warriors one of the more flexible gloves I have ever worn. 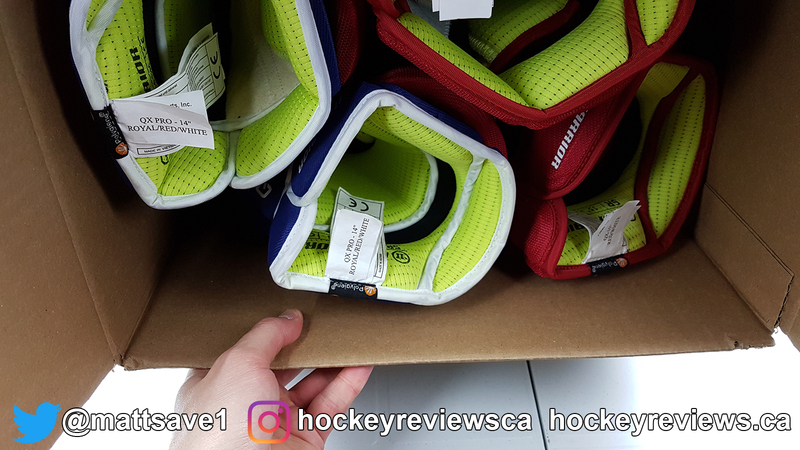 The easiest way to reduce weight on hockey gloves is to obviously reduce material on the glove itself… which is more difficult to do on gloves with a more voluminous design. 4-roll gloves are traditionally a high-volume glove, Warrior scaled the volume down a bit with a more tapered design and removing some of the “wasted” space inside the glove. One of the other effects of tapering the fit of the Alpha gloves is that these gloves don’t feel sloppy or loose on your hands. With that said the Alpha QX line is still a bigger glove than the tight fitting Covert QRL series and the weights below show that. The fact that the Alpha QX gloves are so close in weight to its much tighter fitting sibling is a pretty amazing feet. 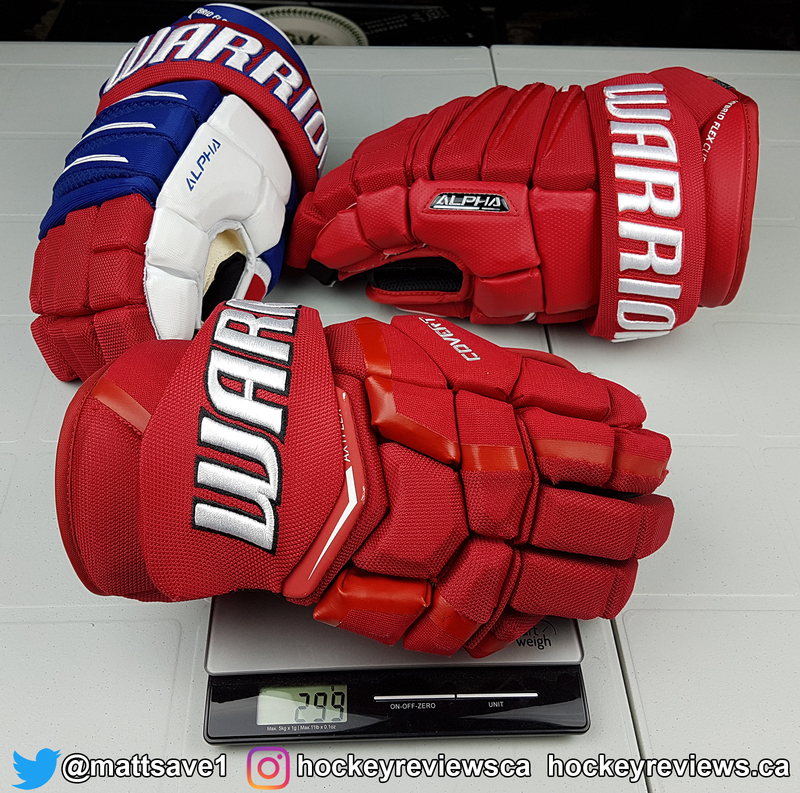 The 15” Warrior Covert QRL Pro glove comes in at 299 grams. The 14” Warrior Alpha QX Pro glove comes in at 283 grams. The 15” Warrior Alpha QX glove comes in at 310 grams. 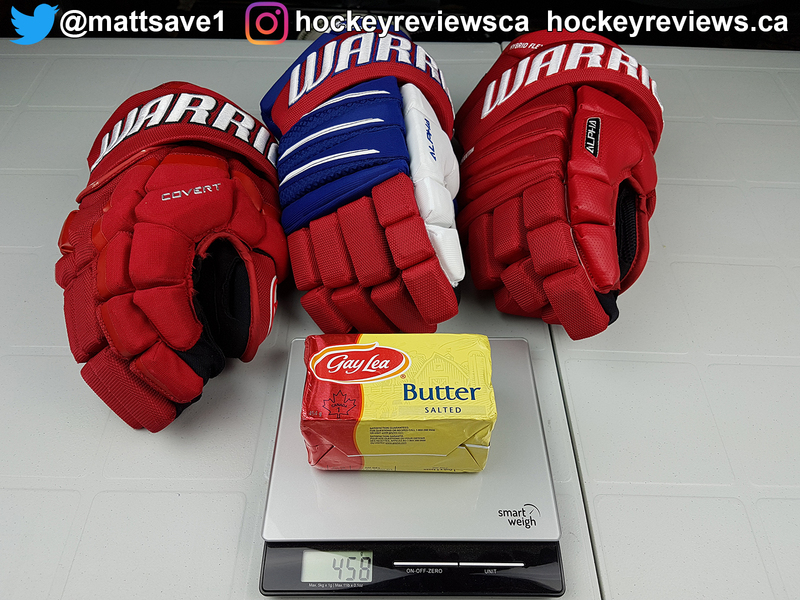 Actual butter comes in at 458 grams, clearly if you want the soft feel of butter on your hands the Warrior Alpha QX glove is the better choice.